Use the form below to generate your own excoffized pictures. Works in any SVG enabled browser (Firefox, Opera, Safari, IE with SVG plugin). jpeg, png, or gif file, less than 128KB in size. Warning: image generation time is limited to 10 seconds. Depending on the size of the original image certain combination of the parameters, computing a picture can be rather slow. In order not to overload my server, any computation that lasts longer than that will be aborted and will produce an error. If you want more time, you're welcome to can download the source and run it locally. 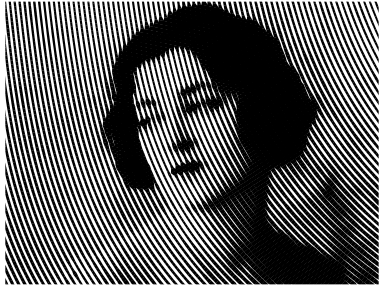 Excoffizer takes a picture and produces a vector rendition of the picture, made of parallel lines of varying thickness. It is inspired by Roger Excoffon's pictograms for the 1968 Grenoble Winter Olympics. The parameters specified in the form control the lines: wiggliness, width, direction, etc. The set of lines computed by those parameters is superimposed on the original image, which determines the varying width of each line. If you want to know more, drop me a line or download the (somewhat obscure) source: index.phps, excoffize.phps, excoffizer-params.phps, utils.phps. The development of this hack has produced a few interesting yet unintended images, due to the author's uniquely crude programming style. See the "Work in Progress" series for a few. For questions, donations, praise, bug reports, please email max@lapin*bleu.net (change * to -). Feel free to send me nice examples, too. Copyright 2008 Max Froumentin. This software is distributed under the W3C® software notice and license.